If you have any questions or want to enquire about dates, use our form to contact Sabine & Olivier Durand-Robaux or see their website for more information. A ten-minute walk from the charming, bustling harbour of La Rochelle is an 18th-century merchant’s house with an immaculate décor and a secret garden. Olivier and Sabine live on the top floor and look after you exceedingly well. Bedrooms and bathrooms are large and luxurious – polished floors, perfect beds, a pleasing, neutral palette. We particularly liked the wine ‘cave’ bedroom at the end of the garden: secluded, vaulted, lit with a warm glow and blessed with a sun terrace. Breakfast, served at small tables in an L-shaped living space, is a treat, and if the sun shines, you spill into the garden. From start to finish Olivier was the perfect host and it was a privilege to stay in this beautiful house. Overlooking the garden our bedroom (Tigue) the garden with. French windows bringing the sound of birds and sunshine. The bed was so comfortable and the decor is calming. Breakfast was served outside on the patio. Highly recommend everything about this stay. Enjoy! This is a wonderful bed and breakfast! We were very warmly welcomed by Monsieur Durand-Robaux, and he was extremely helpful with recommendations for restaurants and travel. 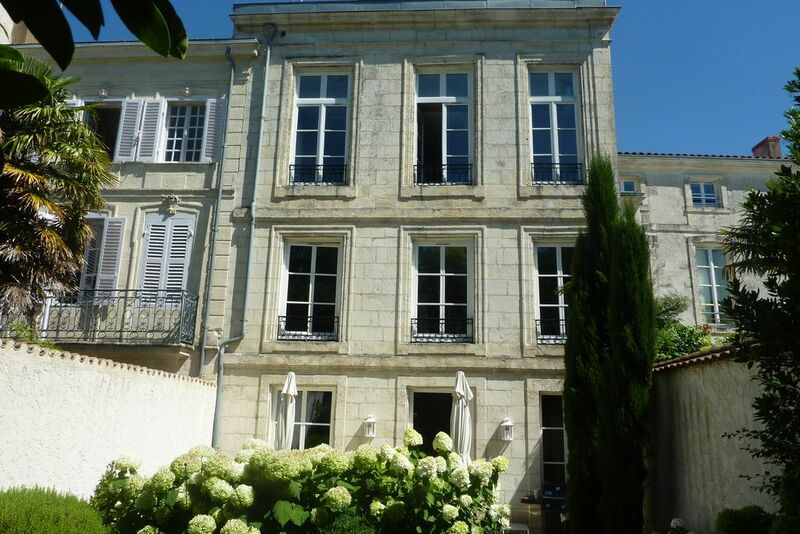 The (beautiful) house is only 5 minutes walk from the bus terminal, so is ideal for a weekend in La Rochelle, as you don't need to rent a car. Our room was spotlessly clean and very comfortable and quiet - we overlooked the garden. Breakfast was superb, with fresh fruit, yogurt, croissants, baguette and brioche. I cannot recommend this B&B highly enough. Don't be put off by the austere appearance on arrival. This is a great find. Monsieur Durand is very welcoming. Our room was lovely, overlooking the garden, so quiet. The accommodation is Clean and comfortable and well appointed. A lovely big bed and great shower. The continental Breakfast was excellent with Quality food. Ms Durand was there to offer all the help you needed to ensure a successful day. We would definitely stay again. Superb location, just five minutes walk to the sea and old harbour. Loved it. A trip to Ile de re a must. We stayed at Entre Hotes for three nights. Olivier was very welcoming and helpful when we arrived. The house is very attractive and our room was pretty and looked out onto the lovely garden at the back. The bathroom definitely had the wow factor and everywhere was immaculate. Delicious breakfasts were served on the terrace. The location is great; just a ten minute walk into the centre of La Rochelle with many restaurants and bars to choose from. Olivier was most helpful with suggestions and also with advice about Ile de Re which we also visited. We hope to return! Arriving at the front door of ‘Entre Hôtes’ B&B, you might be a bit surprised by the austerity of the building. Do not worry! In LaRochelle, the charm of our houses can be discovered inside! Push the door and you will discover a lovely secret garden. We welcome you in our home located downtown across the green scenery of Parc Charruyer. All the rooms have been decorated with precision to create a charming and relaxing atmosphere. You can also play on our beautiful piano! With good humour, we offer you a gorgeous breakfast, local treats and fresh quality produce to start your day. Enjoy the charm of La Rochelle. From the old port, insightful tours, the aquarium, local French markets; it’s a beautiful city with much to offer. You can also enjoy a visit at Le Marais Poitevin, Fort Boyard, Aix Island, Rocherfort… we can give you good advice and information on all the activities.